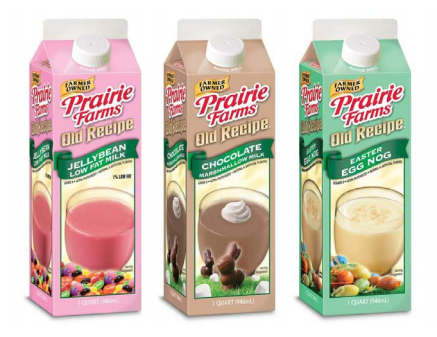 CARLINVILLE, Ill. — Just in time for Spring, Prairie Farms Dairy today announced the availability of its exciting new line of Old Recipe Seasonal Favorites Milk in three thick and creamy flavors: Jelly Bean – a first in the category, Chocolate Marshmallow and Easter Egg Nog. Families are sure to begin a new tradition of celebrating Spring with Old Recipe Seasonal Favorites. Old Recipe Jellybean Milk is low-fat milk delicately sweetened with a sugar/monk fruit juice combination and bursting with fruity jellybean flavor. At only 150 calories per 8-ounce serving, it’s the perfect guilt free sweet treat anyone can enjoy. Old Recipe Chocolate Marshmallow Milk is delightfully rich and creamy chocolate milk with just the right blend of marshmallow flavor and an old favorite, Egg Nog, makes a comeback for Easter. The milk is ultra-pasteurized and has an extended shelf life of 75 days. All flavors are produced using milk from cows not treated with artificial growth hormones. The packaging design allows consumers to easily identify the milk flavors by setting each flavor on a separate color palette and tying the vignette into common nostalgic elements of Easter using jellybeans, chocolate bunnies, marshmallows and Easter eggs. The design is fun, colorful, playful and will stand apart from other products in the dairy case. The cartons also feature a QR code that will drive traffic to the Old Recipe Seasonal Favorites landing page featuring product information, recipes and a coupon. Beginning March 3rd, Prairie Farms Old Recipe Seasonal Favorites, available in quart paper cartons, will be sold in retail outlets throughout the Midwest. Old Recipe Seasonal Favorites are produced in small quantities and available for a limited time only – so savor the spring flavors before they’re gone! Headquartered in Carlinville, Ill., Prairie Farms Dairy Inc. represents over 700 farm families and is one of the largest and most successful farmer-owned dairy cooperatives in the Midwest – with annual sales of nearly $3 billion, 5,700 employees, 36 manufacturing plants and over 100 distribution facilities throughout the Midwest and South. Founded in 1938, Prairie Farms has manufactured and delivered quality dairy products from farm to family for over 75 years; achieved through a commitment from our farm families to producing the highest quality milk available – without the use of artificial growth hormones. Prairie Farms product portfolio includes a complete line of fluid milk products, cottage cheese, sour cream and dips, yogurt, half and half, whipping cream, juice and juice drinks, ice cream and novelties. Prairie Farms distribution footprint covers over 30 percent of the United States; products are available in grocery chains, mass merchandisers, club stores, convenience stores, dollar stores, drug stores, schools, food service outlets and warehouse distribution centers. Prairie Farms charitable giving program, Our Caps, Your Cause, supports a variety of non-profit organizations. www.prairiefarms.com.